Laze away a warm sunny afternoon relaxing over a delicious seafood lunch in the shade of ancient olive trees accompanied by the sound of birds, cicadas and the humming of bees; enjoy a glass of chilled local white wine down in Brindisi harbour and watch the colourful sails of the sleek yachts jostling for position at the start of the annual Corfu sailing regatta; explore the charming city of Ostuni, wandering along narrow roads and alleyways to hidden churches and houses rich with medieval history; bordering the Adriatic Sea in the east, the Ionian Sea to the southeast, and the Strait of Òtranto and Gulf of Taranto in the south, Apulia property offers investors the opportunity to buy property in one of the most archeologically rich and fertile regions in Italy – and all just one hour away from the airports of Bari and Brindisi. Two of the most popular areas to buy property are Brindisi and Ostuni; Brindisi property providing spectacular coastline views of sweeping sandy beaches and the sparkling blue Mediterranean sea and Ostuni property the chance to own a piece of Italian history in the form of a Trulli – a traditional conic-shaped dry stone building whose use by farmers dates back even centuries ago and only to be found in a restricted area of Apulia. Having been settled by the Greeks, the Romans, Goths, Byzantines and the Normans Apulia finally became a kingdom of Italy in 1861. Blessed with a dramatic and natural beauty, the region is know for its warm hospitality and its abundance – it produces more olive oil than the rest of the country combined, most of its fish, 80% of Europe’s pasta and more wine than the whole of Germany. Apulia’s bright sun, crystal blue sea, whitewashed country villages and fragranced fields has been well known to northern Italians for years both as a holiday resort and as a great location to buy a second home, but has only recently started attracting foreign investors. 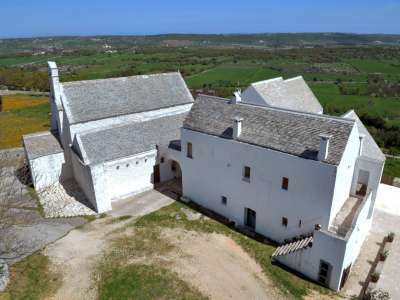 Demand for Apulia property and also for both Brindisi property and Ostuni property is starting to increase as prices in the 'land of the Trulli' are very favourable compared with other parts of Italy. Brindisi is the capital of the province of Brindisi, and historically has played an important role in commerce and culture due to its geographical location on the Italian Peninsula and its natural harbour on the Adriatic Sea - it was thought to be where the ancient Roman road Via Appia ended and where many set off to Greece and the Near East. Walk in the footsteps of ancient Romans, Crusaders and Venetian merchants and visit one of Brindisi’s most famous ancient sites - the End Column of the Via Appia. Composed of Turkish marble, the column remains one of the most important symbols in the city. What you see today are the remains of two Roman columns built around the second century A.D. It is believed the two columns were built in the centre of the port as a landmark for seafarers, marking the end of Via Appia. Feast your eyes on the fabulous architecture of the 13th Century ‘Castello Svevo’ built right in the heart of Brindisi by Emperor Frederick II as a fortified residence for the garrisons. After centuries of abandonment, the castle was first converted into a prison, then a hostel for the Italian Navy and for a short time the residence of King Victor Emmanuel III. Relax down by the harbour and enjoy a glass of wine and a selection of Apulia’s famously creative antipasti – perhaps aubergine stuffed with garlic, mussels baked with onions and tomatoes, huge marinated olives or the wonderful 'fave' - a smooth puree of broad beans which looks like a kind of Puglian humus. Work off your leisurely lunch by taking the short trip across to the other side and climb the Sailors’ Monument to enjoy the stunning 360 degree views of the city and surrounding countryside. Regarded as an architectural jewel, Ostuni is commonly known as the ‘the White Town’ (‘La Città Bianca’) for its white walls and its typically white-painted architecture. Surrounded by ancient olive groves, Ostuni is a wonderful fusion of cobbled alleys winding through white­washed houses, a charming 15th century cathedral and a buzzing social scene centred on Colonna di S. Oronzo, a fine 18th century obelisk at the Piazza della Libertà. Soak up some culture by visiting the Cathedral - the best known landmark of Ostuni. Built between 1435 and 1495 in the late Gothic style, it has a tripartite façade, divided by two pilaster-strips. Above the central portal there is a magnificent rose window with 24 finely carved ribs. The interior of the church is XVIII century and has a level ceiling and Baroque side chapels. Wander the town centre streets which curl up the hill to the steep cobbled lanes of the Old Town with its wrought-iron lanterns and stupendous views out over the coast and the surrounding plains. There are plenty of excellent restaurants in Ostuni so sit back, unwind and enjoy some mixed antipasti followed by freshly grilled fish with tomato, olive and caper sauce – delicious! Italian real estate continues to be a safe investment; a report published last year by Moody’s, ranked Italy ninth in the property market, showing that the average year on year pre-crisis house price increase was a reasonable 5.9%. Even during the financial crisis, Italian property prices grew on average by 0.9% - a far cry from the dramatic property price falls seen elsewhere. Apulia property prices - including Brindisi property and Ostuni property - have risen in the wake of its recent increase in popularity but not too steeply and still remain very competitive compared with other popular regions of Italy such as Tuscany. 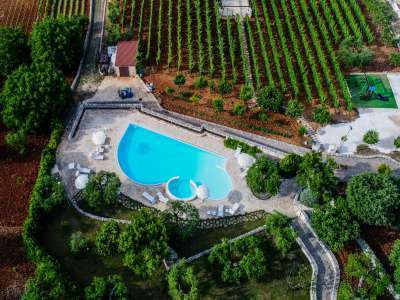 There is a good range of Apulia property to choose from including large countryside houses, elegant villas, traditional Trullis and modern seaside apartments. Nestling in swathes of olive groves in remote rural locations are the Masseries; large mansion farmhouses, which were once at the centre of vast areas of agricultural land, they have been restored to provide wonderfully spacious and luxurious accommodation. If a sea view is top of your list, then head to the coast where Brindisi property offers luxury villas or apartments with wonderful views of the Mediterranean. For something completely different, head further inland where Ostuni property boasts the charming Trulli - circular, conical-roofed white-washed stone houses – often set within their own grounds and surrounded by nut and fruit trees. Blessed with a richly fertile countryside, the longest coastline in Italy, fabulous fresh seafood and a superb range of wine, Apulia offers a relaxed and civilised way of life. Now is the time to invest in Apulia property whilst prices are still competitive; whether you invest in Brindisi property or Ostuni property those wise enough to do so will enjoy their taste of unspoilt Italy.